Tomorrow is February 29 - Leap Year Day - and it is a red letter day ready for the claiming so I have named it The Bad Witch's Festival of the Week. In a common year, February only has 28 days. An extra day is added to the calender every fourth year because the Earth doesn't orbit around the Sun in precisely 365 days. February 29 is added in leap years to correct the discrepancy. The best known tradition associated with Leap Year Day is that it was the only time when it was socially acceptable for women to propose marriage to men. According to Are You Superstitious? by Lore Cowan there is an old superstition that if a woman's offer to marry a man on Leap Year Day is declined, she can demand a silk gown as compensation. However, she must wear a red petticoat when popping the question and the man may ask her to prove it. Steve Roud in The English Year is sceptical of this idea, saying: "If this were true, every unmarried woman throughout history could have had a wardrobe full of silk gowns simply for the asking and for the price of one cheap petticoat." I think Steve Roud is rather missing the point that the man proposed to might have said yes, landing the poor girl with an unwanted husband rather than a beautiful new frock. Hardly a risk worth taking unless the man was a good catch. There is a legend that in Scotland in 1288 Queen Margaret created a law that if a man did not accept a proposal on Leap Year Day he had to pay a fine of anything between £1 and £100. Steve Roud also dismisses this claim, pointing out that there isn't any evidence of the law ever existing except in popular imagination. These days, even though women can propose to men any day they want to, there is still a bit of a feeling that the man should be the one to ask. Personally I think us women could do a lot worse than claiming Leap Year Day as our own - a day to don red petticoats with pride and make any demands we want from the men around us - certainly not just marriage. If they refuse to do what we ask, we should demand they take us dress shopping at once! 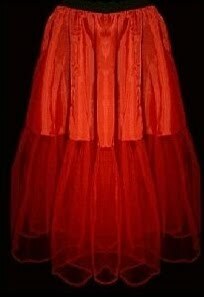 The photo shows a 29" Red Rock n Roll Underskirt Petticoat that can be ordered through Amazon.